you are an artist? discover the shoemaker who is in you! you are an artist and you want to reinterpretate a Ferragamo shoe? put yourself to the test by clicking to the above link. Maybe your work will be shown in Museo Ferragamo's web exhibition! tu eres un artista y quieres reinterpretar uno zapato de Ferragamo? ponte a la prueba teclando sobre la web indicada. Ojala tu obra pueda ser exhibida en la exhibition digital de la web del Museo Ferragamo. In the middle of Florence, in Via Tornabuoni, there is a museum dedicated to the production of this legendary shoemaker, Salvatore Ferragamo, from his return in Italy from USA in 1927 since his death in 1960. The museum is a "walk" (as we talk about shoes!) to see the creative and tecnical evolution of Italian fashion. En en centro de Florencia, in Via Tornabuoni, hay un museo dedicado a la producciòn del legendario zapatero, Salvatore Ferragamo, de su vuelta a Italia de EEUU en 1927 hasta su muerte en 1960. El museo es un "paseo" (dad que hablamos de zapatos!) para ver la evolucion creativa y tecnica de la moda italiana. Dans le centre de Florence, en Rue Tornabuoni, il ya un musee dediè a la production du legendaire cordonnier, Salvatore Ferragamo, de son retour en Italie des Etas Unis jusqu'au sa mort en 1960. Le musèe est une promenade ( on parle des chaussures!) pour voir l'evolution creative et tecnique de la mode italienne. "Tuscany Lovers" is a project followed by the official site of regione Toscana where you can hear the voices and the ideas of many foreigner people who have decided or happened to live in Tuscany. "Tuscany Lovers" (los amantes de Toscana) es un proyect creado por la web official de la region Toscana donde se pueden escuchar los testigos de muchas personas extranjeras que han decidido o que le ha pasado de vivir en Toscana. dario cecchini the poet of the steak! Well, Tuscany is a place where you can find good meat, Florence is known for its Florentine Steak.....and Dario Cecchini, the most famous butcher in Italy, is called "the steak poet". Let's discover why! Bueno, Toscana es una region donde puedes comer carne muy buena, Florencia es conocida por su "chuleta a la florentina" y Dario Cecchini, el cernicero mas conocido de Italia",es llamado "el poeta de la chuleta. Vamos a descubrir porque! Bon Toscana est une region connue par sa viande tres bonne, Florence est connue par sa steak a la florentine et Dario Cecchini, le plus celebre boucher en Italie, est appelè "le poete de la steak". On va a decouvrir le pourquoi! luisa via roma when fashion is a must! Florence is one of the fashion cities in Italy and Luisa Via Roma, the trendiest and coolest shop in Florence, is one of the hearts of worldwide fashion. In its site you can see the latest fashion trends, the video style guides and the blog with its ultimate news. Florencia es una de las ciudades de la moda en Italia y Luis Via Roma, la tienda mas trendy y cool de Florencia, es unos de los corazones de la moda mundial. En su web puedes encontrar las ultimas novedades en la moda, las guias videos en hecho de estilo y en su blog las ultimas noticia del mundo de la moda. From 4th to 13th February, "La fiera del Cioccolato" (the chocolate fair) in Piazza Santa Croce will be the heart of the Florentine Carnival with many exhibitors, workshops, a photographic exhibition curated by Alinari about the history of chocolate. Del 4 al 13 de Fevrero, "La fiera del Ciocciolato" (la feria del chocolate) en Piazza Santa Croce serà el corazòn del carnival florentino con muchos expositores, talleres, una exposiciòn fotografica curada por Alinari sobre la historia del chocolate. Du 4 au 13 Fevrier "La fiera del Ciocciolato" (la foire du chocolat) en Piazza Santa Croce serà le coeur du carnival florentin avec beaucoup des expositeurs, laboratoires, une exposition photographique curèe par Alinari sur l'histoire du chocolat. Google Art Project is the new project made by Google team that permits to explore museums from all around the world, exploring them and seeing their collections : Uffizi Gallery is among them. Let's explore it! Google Art Project es el nuevo proyecto creado por el equipo de Google que permite de visitar virtualmente museos de todo el mundo, explorandolos y visitando a sus colleciones: entre ellos se encuentra tambien la Galleria de lo Uficios. Vamos a visitarla! Google Art Project est le nouveau projet cree par l'equipe de Google qui permit de visiter aucuns des musees plus imports du monde et voir ses collections: entre ces musees on trouve aussi La Gallerie des Offices! On va la visiter tout de suite. Florence est vraiment un musee à l'air livre! museo capucci when a dress is a dream! 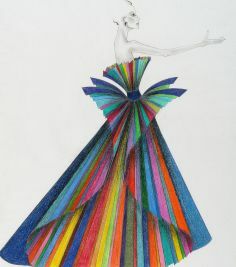 Roberto Capucci is one of the genius of the Italian fashion with his dresses that can be defined "tissue sculptures". The Museum Capucci is hosted at Villa Bardini, between Forte Belvedere and Palazzo Pitti and it show the creative path the Capucci made all through the years. The Capucci Foundation also organizes courses about some technical aspects of fashion world expecially about the two that caractherizes the style of Capucci: the coulour and the plissè. the vasarian corridor an occasion to see it! The Vasari Corridor (Corridoio Vasariano) is the passageway that connects Palazzo Vecchio with the Palazzo Pitti passing through Ponte Vecchio. It belongs to the Uffizi Gallery, hosting the famous museum collection of selfportraits. From 2nd February to 15 April there will be an extraodinary opening with guided tours in italian. El corredor vasariano (corridoio vasariano) es el pasaje que connecta Palacio Viejo con Palacio Pittti, pasando por el Puente Viejo. Pertenece a la Galeria de los Uficios, con su famosa collecion de autoretratos. Del 2 de Fevrero al 15 de Avril hay una abertura extraordinaria con percursos guiados en italiano. Le passage vasariane (corridoio vasariano) est le passage qui connecte le Palace Vieux avec Palace Pitti, en passant a travers du Pont Viex. Il appartient au Musee des Ofices avec sa collection de autoportraits. Du 2 Fevrier au 15 Avril il y a une ouverture extraordinaire avec visites conduites par guides italiennes. vetrina toscana how to find tuscan food! "Vetrina toscana" (tuscan shop-window) is the office site made by Regione Toscana, where you can find information about markets, restaurants, events where you can eat good food with tuscan ingredients! "Vetrina toscana" (el escaparate toscano) es la web oficial de Regione Toscana donde puedes encontrar informaciones sobre mercados, restaurantes, eventos donde puedes comer comida con ingredenties que llegan de Toscana. "Vetrina toscana" (vitrine toscane) est le site officiel de la Regione Toscana ou on puet trovez des informations sur marches, restaurants ou evenements ou on peut manger des plats faits avec ingredients toscans.